Have you ever been in a dark room where the only light came from a single lamp–where you could only see enough to know that there was so much more that you couldn’t see? This is how I often feel when I am trying to find my place and purpose, trying to figure out what to do or when I just need direction. The lamp gives off just enough light to illuminate the uncertainty and fear you feel, because you can’t see beyond what’s lit up around you. You can’t see what lies in the darkness beyond the light. 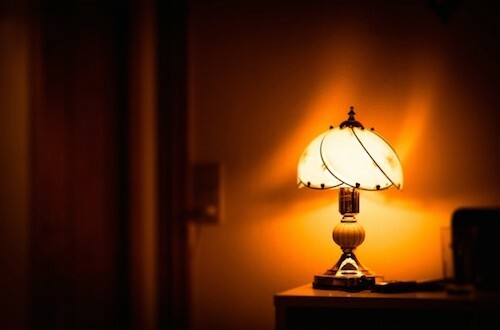 When a lamp is lit in a dark room, it lights up only so much, it is not a flood light. Anything beyond the light given off from the lamp is still in darkness. To see more, you must not only move, but you must take the lamp with you. God has knowledge of our entire life’s journey and He wants to guides us. He has called us out of darkness and into His marvelous light. His light illuminates all around us, but like a lamp, it reveals only so much. He does not reveal all of His knowledge about our future to us at once. We must walk with Him daily. We must trust Him when we cannot see what lies ahead. Then He directs our path and leads us in the way in which we should go. God doesn’t want us to remain in the dark. He wants us to know His plan and purpose for our lives. He wants us to know the direction and path to choose when we come to a fork in the road. If He didn’t, He wouldn’t tell us: He would direct our steps (Proverbs 16:9), that He would teach us the way we should go (Psalm 32:8) or that He has plans to give us a hope for our future (Jeremiah 29:11). But, there is a prerequisite. We must trust Him. So when you are standing in a room that is lit up just enough for you to see the darkness that lies ahead. Find comfort and peace in knowing that He knows all things, especially what is in the unknown. Seek His guidance and direction, acknowledge Him as Lord and King of your life and He WILL direct your paths. What is it that keeps you from trusting God completely? Will you allow His light to illuminate your path a little at time?